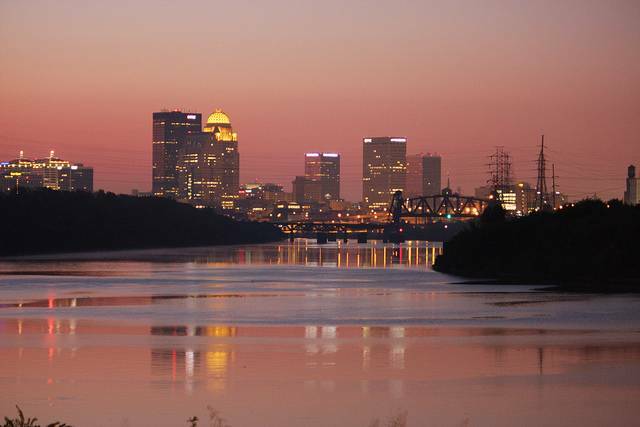 Louisville was voted the manliest city in America by GQ Magazine. Legend has it that the University of Louisville Cardinals basketball team originated the high-five during a practice of the 1978-79 season. High-fives can even be seen during the highlight reels of that year. The historic Old Louisville neighborhood is one of the largest Victorian neighborhoods in the U.S. It also has more pedestrian-only streets than any other neighborhood in the country. A now closed Louisville eatery, Kaelin's Restaurant, claimed to be the original inventor of the cheeseburger. A Virginia militia man, Captain Aaron Fontaine, moved to Louisville in 1798. Before the abolition of slavery, his plantation was a stop on the Underground Railroad. Later, in 1905, the city built an amusement park on the site of the old estate and, in his honor, named it Fontaine Ferry Park. Ironically, the park was "whites only" until 1964. Two Louisville kindergarten teachers, Patty and MIldred J. Hill, created the "Happy Birthday to You" song. It was originally entitled "Good Morning to All" but was later changed to fit a birthday theme. Screenwriter Stephen Gaghan initially wanted to include his hometown, Louisville, in the movie "Traffic." However, he decided that Cincinnati's inner city looked seedier and would serve the film better. At 6,218 acres, Louisville's Jefferson Memorial Forest is the largest municipal urban forest in the country. Renowned professional boxer, Muhammed Ali, was born in Louisville. The Louisville Redbirds were the first minor league baseball team to draw more than 1 million fans in a single season. Contact Family Realty at 502-458-4100 or www.ViewLouisvilleHomes.com for all your home buying and selliing needs. Let us show you why we are one of the Top 15 Real Estate Teams in the Greater Louisville Area!